A new report reveals the vast majority of workers are immigrants and people of color who earn about $8 less than the industry average. New Yorkers see food as an indulgence and a craft, amid a brimming urban cornucopia of artisanal honey farmers, craft breweries and bustling farmer’s markets. But good eating for this city is not just a lifestyle but a serious industry—one that’s often as hard on its workers as any fast food kitchen or factory farm. Processing plants and industrial bakeries churn out much of the city’s specialty food. And for workers, Gotham’s glamorous harvest belies a hidden rot. According to a new report published by Brandworkers and the Urban Justice Center (disclosure: the author once interned and volunteered at UJC), the city’s food manufacturing workforce of 14,000 is an often neglected link in the food chain, tarnished by dangerous jobs, poverty wages and discrimination. In a survey of the workforce, the vast majority immigrants and people of color, workers earned nearly $8 less than the industry average. About 40 percent of those surveyed reported being injured on the job—like in a fall or getting struck by equipment. Over half said they “had to work sick in the past year,” and most had never received workplace health and safety training. In this industry known for organic baguettes and vintage pickles, labor practices contrast sharply with the nostalgic artisanal imagery. Some workers said they were repeatedly shorted on overtime pay. One worker estimated that he lost $6,000 or $7,000 each year in unpaid overtime wages. Others complained of erratic schedules that left them struggling to get enough hours to support themselves. At the company where I work, a young man arrived to work a little while back, and now he is already a manager in spite of the fact that there’s another coworker, a woman, who had more experience, more knowledge, and everything. She was not valued. It’s terrible. 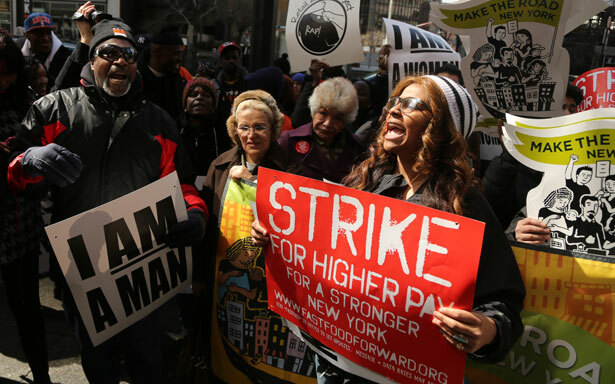 Workers often face retaliation for trying to organize. One worker recalled, “when we were organizing, the people that they viewed as leaders—like the people who most supported bringing in the union—well, they were fired, so those were the consequences they had to face for trying to assert their rights.” While other sectors in the food system have historically been unionized, such as transport and distribution workers, the decentralized structure and social marginalization of the labor force has impeded workplace organizing in manufacturing firms. Some campaigns may take longer to ripen. At Amy’s Bread, a prominent gourmet local bakery, workers have been protesting for months, complaining of low pay and a lack of affordable healthcare, and calling for better working conditions and a more mutual relationship between workers and the management. Although the management rebuffed the group’s demands for labor dialogue last winter, the group says it is pursuing a “new escalated phase of the campaign” that aims to reach out to the public “to start educating customers about their opportunity to help create a sustainable Amy’s Bread.” Through social media campaigning and picketing, workers and community allies have banded together to shame the company for labor practices unbecoming of a business branded as a chic mom-and-pop shop. In a past interview with Salon.com , founder Amy Scherber rejected the reports of mistreating workers and suppressing organizing, and said the company opposed the workers’ campaigning with Brandworkers’ assistance, because it “just stirs up everybody who is really happy doing what they do.” In a follow-up email exchange with The Nation, Scherber says again that the staff are “treated well,” and “I have always had an open door and have told them to come and talk to me at any time,” but the company has still “not had a discussion with a third party involved at this point.” As the public campaign intensifies, however, if consumers find the labor spat distasteful, perhaps the power of reputation can help catalyze the rank-and-file organizing. Beefing up workplace rights across the industry requires coordination among rank-and-file organizers, labor advocates, government and consumers, integrated into an ethical food movement. So advocates are pressing the city to incorporate labor rights into its food policy, and innovations in food production into its economic development policy. A 2013 report by the think tank New York City Food Policy Center outlined a multi-pronged approach to strengthening the city’s food workforce by investing in training, small business development and commercial infrastructure to create about 10,000 “good food jobs.” Some of these would involve seeding new businesses with strong labor standards. Other new jobs would be upgrades from low-end production work to better-compensated positions in, say, organic agriculture, transporting from regional farms or packing fresh produce to facilitate local specialty retailers. Another step forward would be committing institutions to reward responsible producers through procurement policies—for example, by requiring that schools and hospital cafeteria contract with producers that meet high labor standards or employ union labor. New Yorkers take eating seriously while often neglecting the labor that feeds them. But truly good eating demands integrity from seed to skillet. The city is now realizing the value of blending fair food principles with fine food traditions. This piece has been updated with news on the Amy’s Bread campaign.